PIGMENT gets a lot of visitors from all over the world every day. 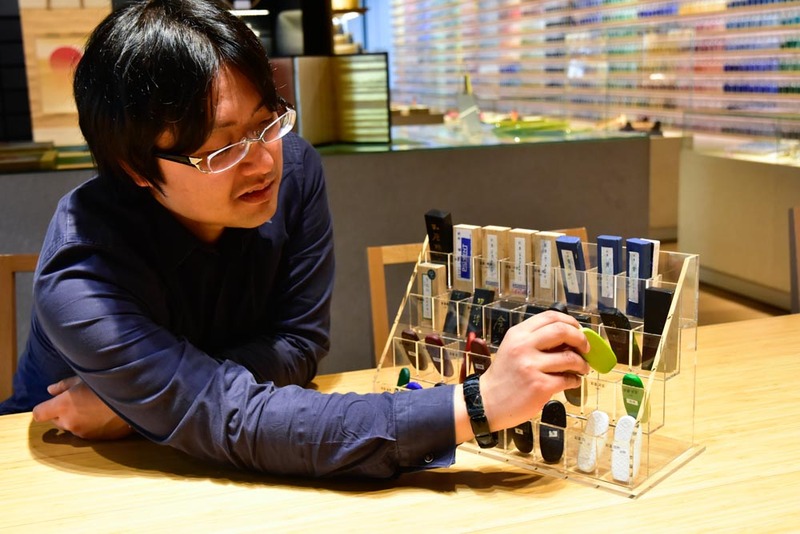 Among them, Saiboku, the colored ink stick, is one of the most popular items. You might not be familiar with colored ink sticks, but there are actually ink sticks of various colors other than the black sumi color. 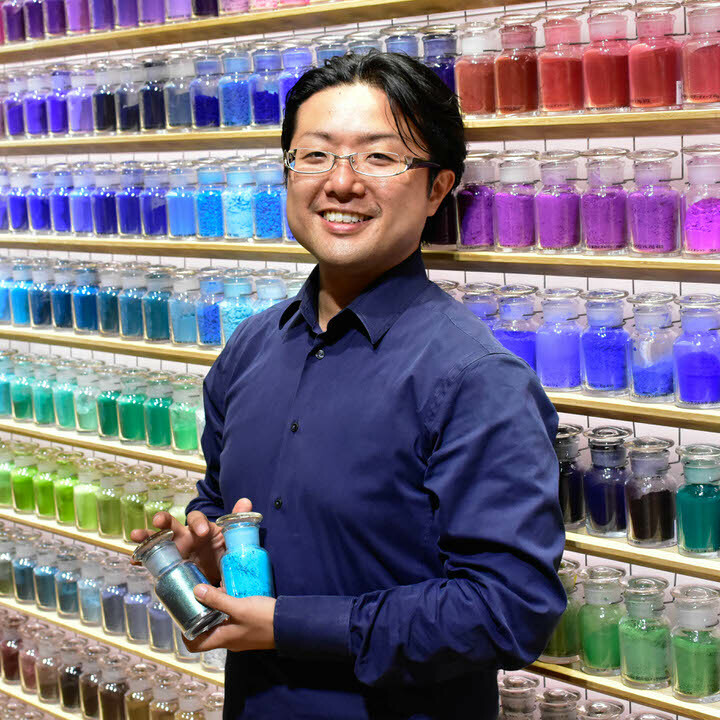 In this article, we asked the chief Iwaizumi about this product. ー There are a lot of colorful sumi ink sticks. Were these colored ink sticks existed from ancient times? Yes. Although the accurate date is unknown, they have been used as an art material in East Asia, and the red ink for correction marks are one of the first colored ink sticks. ー So, the black sumi ink and red ink were initially used in early times. 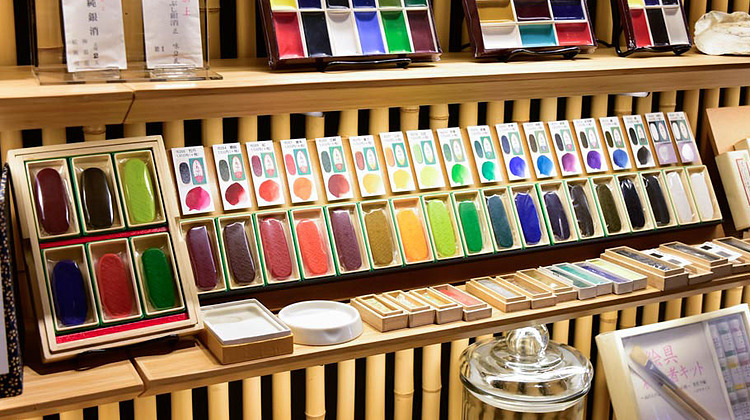 Now, there are various types of sumi ink sticks displayed in PIGMENT. About how many kinds do you have? As a product, we have 4 different kinds of colored ink sticks, Saiboku, Saikaboku, Saibokuaya and Shuboku. Saiboku and Saikaboku are the same in terms of the ingredients and materials but have different shape. 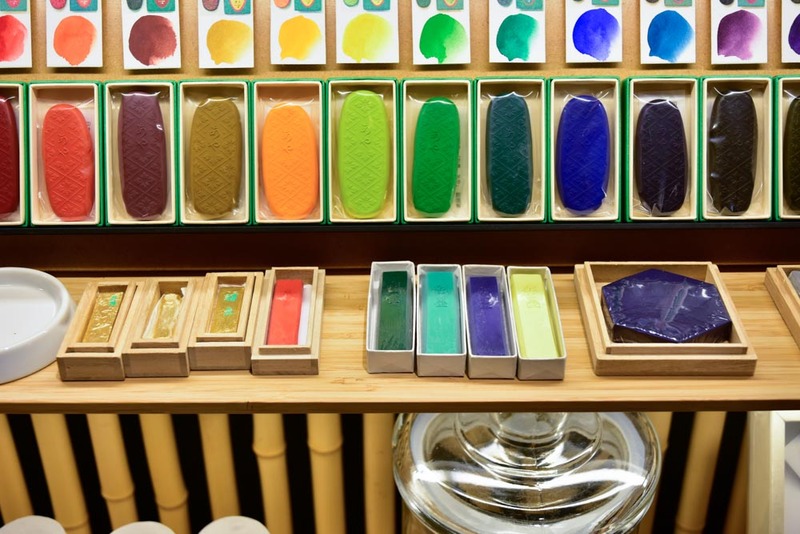 Also, because all of them are made from kneading pigments and animal glue, you can create the colors and expression that goes with Japanese paintings. ー How do you use them? Is it the same as the sumi ink sticks? Yes, you rub them just like you do for the sumi ink stick. 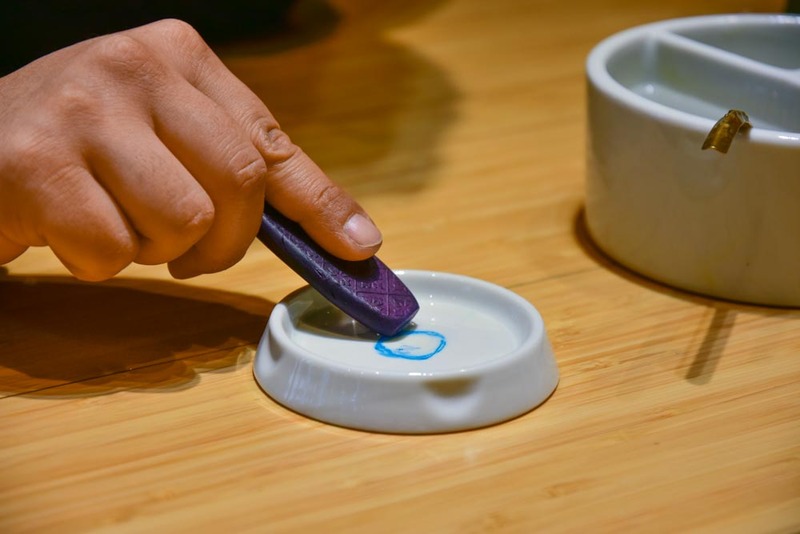 However, if you rub them on the black ink stone, it is harder to see the colors. That is why we recommend the white ceramic ink stones for color ink sticks. Also, for such small ink sticks, it is easier to rub it diagonally since the surface is relatively smaller. ー I see, the colors are well seen on the white stone. You mentioned earlier that Saiboku and Saikaboku are almost the same except the shape, but what are the differences between Saibokuaya and these? Saiboku and Saikaboku are very good products but at the same time, they have issues regarding the production and diminution in quantity of the materials. Saibokuaya was made to improve these issues and colors are also renewed. The colors are toned under the theme of “Japanese traditional colors”, where each color has its Japanese name. ー Is there any other feature of Saibokuaya? Saiboku and Saikanoku have pastel colors but Saibokuaya does not. That is because you can mix white to have the low saturation. Instead, Saibokuaya can create colors with high saturation like “Kasane no irome”, the colors used for female court attire in Heian period. ー What is your favorite color from this Saibokuaya series? I personally like Kariyasu (Greenish Yellow) and Asagi (Pale Blue), as it is hard to create by myself. It is obvious when you see them in real, but there are a lot of differences between the colors of the ink stick itself and the color when you paint it on. Please visit our PIGMENT lab to see the difference and feel free to try them! Our online store has Saibokuaya (colored ink sticks) as well as Saiboku Box Set, which you can try easily and enjoy the world of color ink sticks. Please click the link below for details.